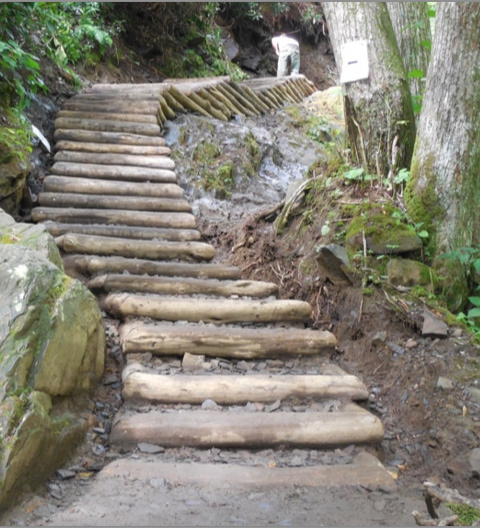 The Trails Forever volunteer program is an opportunity for you to work closely with park staff and gain experience doing a wide range of trail rehabilitation work. The following information should provide answers to most of the frequently asked questions about the Trails Forever program. Please read over all of the information thoroughly before applying as a Trails Forever volunteer. How do you become a Trails Forever volunteer? Volunteer work days for Trails Forever are every Wednesday, May through August. Prior registration is required. Please contact Trails and Facilities Volunteer Coordinator Adam Monroe at 828-497-1949 or adam_monroe@nps.gov for more details and to register. Do I need experience to volunteer for Trails Forever? 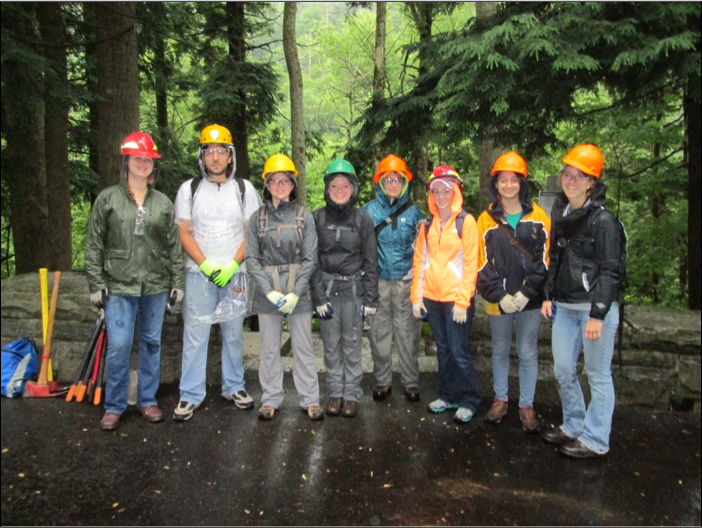 The Trails Forever program provides opportunities for both skilled and non-skilled volunteers. 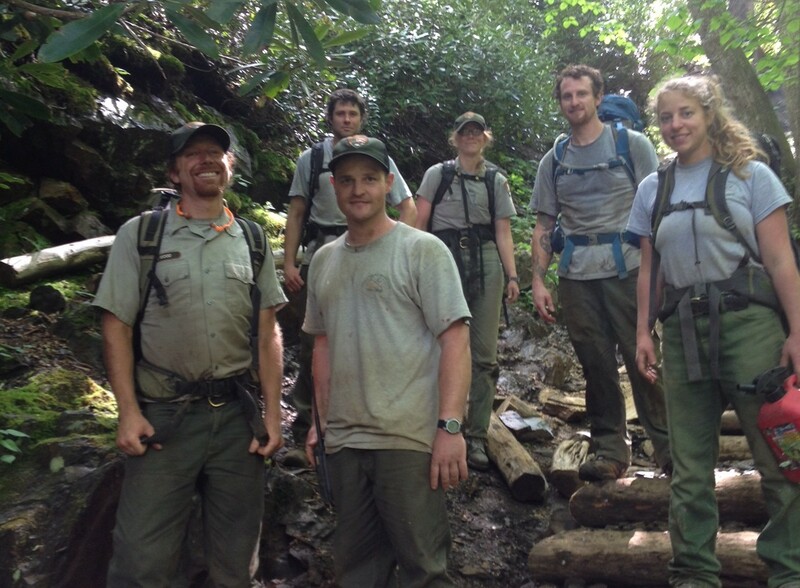 What kinds of work do Trails Forever volunteers do? Trails Forever volunteers perform a wide range of trail maintenance and trail rehabilitation work. The particular jobs you are assigned will vary depending on your experience level and may include installing drainage structures (i.e. waterbars, check dams), rehabilitating trail surfaces, constructing turnpikes (raised trail segments), removing brush and vegetation, or building foot logs and bridges. 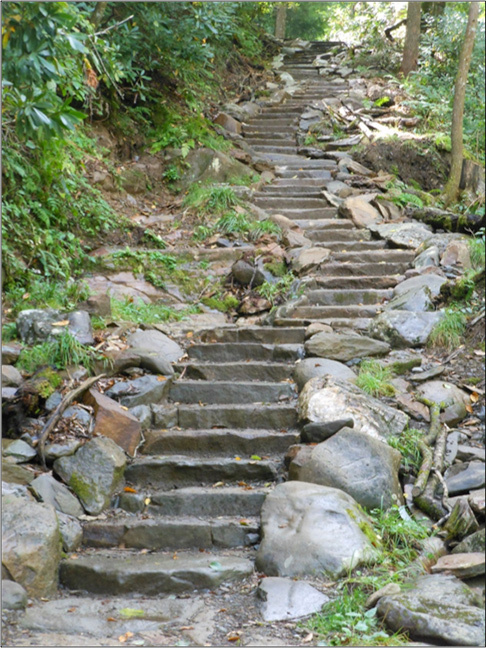 While these jobs may vary in complexity, all Trails Forever volunteers must be able to hike and safely perform strenuous and often difficult manual labor. 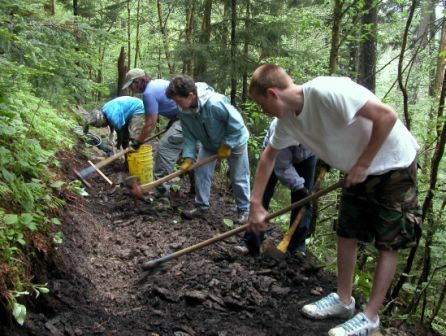 Volunteers should be able to hike at least 4 miles and be comfortable lifting heavy objects and using hand tools such as: shovels, fire rakes, Pulaski/axes, sledgehammers, etc. Do I have to hike to be a Trails Forever volunteer? Yes. Most of the Trails Forever projects will require at least some hiking. You must be able to hike at least 4 miles and then be able to do hard physical labor in order to participate as a Trails Forever volunteer, since many projects are at least 2 miles from a road or parking area (and 2 miles back). Can children be Trails Forever volunteers? There will be opportunities for young people to take part in some Trails Forever projects. It is important to remember that most of the project locations will be accessible only by foot and may require hiking 4 miles or more. This means that Trails Forever is not suitable for young children. Trail work also involves the use of hand tools, many of which have sharp edges not suitable for children. Any projects that can accommodate children will be advertised as such. Remember that minors must be accompanied by a parent or guardian. How long are Trails Forever volunteers required to work? Typically Trails Forever workdays will start at 9:30 and end at 3:30. If you need to leave early or arrive late, let the Trails Volunteer Coordinator know before you come out. Volunteers are required to provide their own backpack, food, water and clothing. All tools and necessary equipment will be provided. You must wear closed-toes shoes (preferably boots) and long pants. You may not wear sandals or other open-toed shoes. Volunteers are also responsible for cold-weather and rain gear. 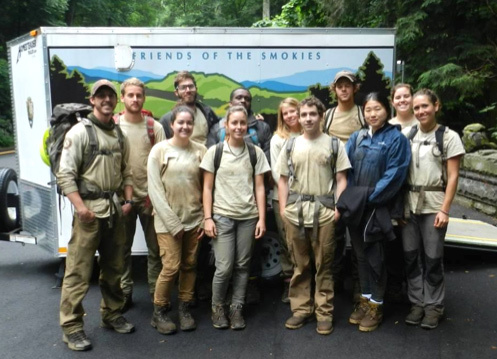 Weather in Great Smoky Mountains National Park is often unpredictable and volunteers must be prepared for a range of potential weather conditions. Where do you meet for Trails Forever projects? Volunteers will meet the Trails Forever crew at the trail head or parking area. Specific meeting places will be stated in the Current Projects section of the Trails Forever website. Volunteers are expected to be on time and prepared to begin work. The Great Smoky Mountains experiences high amounts of visitation. Most of the roads are curvy and travel is often slow, so please allow yourself extra time to reach your destination. Remember, MapQuest travel times do not account for curves, tourists or mountain weather. Be sure and pack your materials and plan your trip the night before. There is no cell phone service in many parts of the park, so there is no way to notify Park personnel if you arrive late. Tardiness will result in a wasted trip. How do I get to the meeting place? Volunteers are responsible for their own transportation to and from the designated meeting places. If you want to support the Trails Forever program in other ways, click below to make a donation.